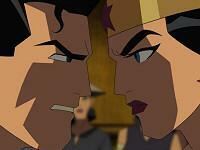 Overview - The New Frontier takes viewers on an action-packed adventure, exploring the origins of the Justice League. DC Comics legends Superman, Batman and Wonder Woman are all featured in the film as well as Green Lantern, Martian Manhunter and The Flash – as they band together to form the legendary super team. Strangers at first, these very different heroes must overcome fear and suspicion to forge an alliance against a monster so formidable, even the mighty Superman cannot stop it alone. If they fail, the entire planet will be cleansed of humanity. Comic fandom has always incited raging debates amongst the most passionate followers. Which publisher produces the greatest material: Marvel or DC? Who has the best stable of characters: Marvel's Avengers or DC's Justice League of America? Who boasts the most relevant icons: DC with Superman, Batman, and Wonder Woman, or Marvel with Captain America, the Hulk, and Wolverine? Take my word for it dear readers, none of these arguments is as intense or widespread as the fight over which era is the greatest in comics' history. I've seen people get into shouting matches over the relative superiority/inferiority of the Golden Age (the 1930s through the late '40s), Silver Age (1950s through the late '60s), Bronze Age (the early '70s through the early '80s), and the Modern Age of comics. Enter award-winning writers like Mark Waid and Darwyn Cooke. In 1996, Waid successfully developed a DC Comics mini-series called "Kingdom Come," an allegory that explored the gap between Golden Aged heroes and modern sensibilities. For a brief moment, multi-generational readers understood their older and younger brethren a bit better -- his deft storytelling had effectively bridged the gap between fans of multiple eras. In 2003, Cooke followed in Waid's footsteps with a mini-series called "DC: The New Frontier," a tale of Golden Age heroes entering the Silver Age amidst the socioeconomic and political uncertainty of the Cold War. His work went on to win top prizes at the Harvey, Shuster, and Eisner Awards. 'Justice League: The New Frontier' is a direct-to-video animated adaptation of the award-winning series that features an impressive cast of voice actors. With the emergence of the Cold War and with it, global paranoia, the help of legendary heroes like Superman (Kyle MacLachlan), Batman (Jeremy Sisto), Wonder Woman (Lucy Lawless), and The Flash (Neil Patrick Harris) isn't as welcome as it once was. As they struggle to find their places in the new world, a prehistoric forced referred to as the Centre (Keith David) appears and threatens to destroy mankind. In response, Earth's Golden Age heavyweights must draw on the talents and abilities of new heroes like Green Lantern (David Boreanaz) and the Martian Manhunter (Miguel Ferrer), and further employ the powers of an eclectic group of freedom fighting humans like Lois Lane (Kyra Sedgwick), Carol Ferris (Brooke Shields), King Faraday (Phil Morris), and Ace Morgan (John Heard). These diverse heroes of the '40s, '50s, and '60s must put aside their differences and work together if they have any hope of saving the world. 'The New Frontier' works for two major reasons -- the gorgeous animation perfectly evokes Cooke's original art, and the screenplay really manages to nail the personalities and interactions of its iconic characters. Some may write-off the character animation as stocky, but I think the animators have tapped into a style that blends Jack Kirby's classic, squared design work with the explosive fluidity of Bruce Timm's "Batman: The Animated Series." The screenplay heightens the tone even further with sharp origin stories and fantastic introductions to the characters. Martian Manhunter arrives on the scene with an air of humanity about him, Wonder Woman perches atop a table like a warrior queen, Hal Jordan gets caught in a dogfight, Batman goes toe to toe with more than two dozen swarming cultists -- to be blunt, 'The New Frontier' really knows how to get a fan's attention. There are so many visually thrilling "yeah!" moments that I simply lost count. Unfortunately, the excitement fades as it becomes clear that the experience is fairly hollow. Despite the rousing action scenes, the story has been reduced to its bare essentials, effectively neutering the nuanced, layered power and political intrigue of Cooke's original series. Entire subplots have been mercilessly left on the cutting room floor (the racially charged story of John Henry, the Dinosaur Island intro, and the Suicide Squad's backstory, just to name a few) and the film never feels as epic as its cataclysmic events would suggest. 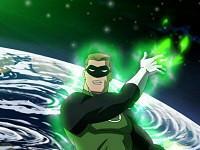 It also feels stilted -- by the time Hal Jordan became Green Lantern, I had lost complete interest in the character. I hate to continually compare the film to its source, but Cooke really understood pacing. In turn, he allowed the heroes to develop one at a time before they banded together to fight the Centre. 'The New Frontier,' on the other hand, takes forever to introduce the characters, leaving a few, short minutes to bring them together. Don't get me wrong, I love the first half of 'The New Frontier'... I just wish the producers had added an extra 15 minutes onto the middle of the 75-minute runtime to give the story some much-needed, second-act breathing room. It also doesn't help that some of the actors sound bored out of their skulls. My hat is off to David Boreanaz, Phil Morris, Kyra Sedgwick, and Keith David, all of whom seem to inhabit their characters and enjoy their time in the sound booth. I was especially pleased with the performances of Miguel Ferrer and Neil Patrick Harris, both of whom turn in genuinely convincing portrayals of their characters. Sadly, Lucy Lawless sounds as if she's taking a nap, Kyle MacLachlan doesn't inject enough soul into Supes, and Jeremy Sisto sounds like a kid skipping class, rather than a crime fighting detective. In the worst instances, Cooke's original dialogue usually swoops in to save the day, but I can only imagine how much more I would have enjoyed the film if the Big Three actually sounded like the Big Three. All in all, 'The New Frontier' is a fun little diamond in the rough that's worth your time. Fans of the original Cooke graphic novel may be disappointed with the changes made to the story itself, but, like me, they'll probably still find plenty to enjoy. Have no fear DC fans... this is a decent offering and a quality production that makes me excited to see what else Warner Brothers Animation has up its sleeve. As many readers have pointed out, DC Comics' first foray into high-def, straight-to-video animation warrants a direct comparison to animated Marvel Comics' flicks like 'The Ultimate Avengers Collection' and 'Doctor Strange.' The verdict? 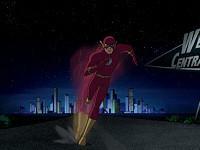 'Justice League: The New Frontier' not only boasts higher quality animation, its technical presentation is stronger and more stable. The vibrant palette and vivid colors that frequent this 1080p/VC-1 transfer are apparent from the opening seconds of 'The New Frontier' straight through to the final moments of the epilogue. 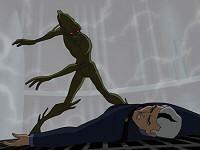 To my relief, the animators were able to strike a perfect balance between the subdued, Golden Age hues of Cooke's graphic novel and the blazing intensity of Superman's flight trail, the Centre's death rays, and Martian Manhunter's glowing eyes. Inky blacks preserve the tone of the original artwork and flawless contrast makes the image three dimensional despite its 2D source. Every last detail in the animated stills has been cleanly rendered in the final transfer -- the dials of the Gotham City Observatory, the debris from Hal Jordan's shuttle explosion, and the tiniest winged creature are comprised of crisply defined linework and solid color fills. Of course, the very nature of high definition subjects the animated source to a serious amount of scrutiny that uncovers some minor flaws. Color banding seems to be a consistent blight on 2D animation and it makes a fair number of appearances in 'The New Frontier.' While it isn't nearly as prevalent or distracting as it is in the Marvel Comics' animated films, banding still manages to make the transfer appear antiquated at times. To top it all off, the increased resolution also reveals random pixelation amidst tight linework -- especially around the characters' eyes. Even so, 'The New Frontier' looks fantastic on Blu-ray and bests the dull standard DVD by leaps and bounds. Anyone still convinced that 2D animation doesn't benefit from the upgrade to high definition should take a look at this superior 1080p release. While it may seem like overkill for a 2D animated film, Warner graces 'The New Frontier' with a bombastic Dolby TrueHD 5.1 surround track (48 kHz/ 16-Bit) that really delivers an impressive sonic experience. The voice cast's crisp dialogue is mainly contained in the front of the soundfield, but aggressive rear channel support is utilized to convey a convincing sense of dimensionality and space. Explosions erupt from every direction, demonic screeches bound around the soundfield, and superheroes swoosh from channel to channel without a hitch. Best of all, the subwoofer gets an intense workout from an onslaught of LFE-enhanced rumbles and booms. Compared to the muffled Dolby Digital mix on the standard DVD, this lossless high-def track is an absolute revelation. Alas, despite its remarkable strides, the sheer nature of low-budget 2D animation hinders 'The New Frontier' from achieving its full potential. Sound effects are sometimes flat and centralized, accuracy is occasionally hit or miss, and environmental ambiance is often non-existent. While the blame lies squarely on the sound designers' shoulders, these shortcomings prevent the TrueHD track from being the 5-star powerhouse that it could be. Despite its minor sound design hiccups, the technical tenacity and fidelity of this lossless mix will surprise a lot of fans and catch the attention of anyone in the immediate vicinity. Once again, high-def is clearly the way to go with this release and justifies the increased cost of the Blu-ray edition. 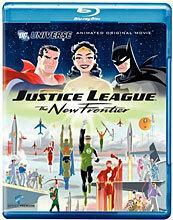 The Blu-ray edition of 'Justice League: The New Frontier' ports over all of the robust extras from the standard DVD and all I can say is "wow." I never expected to be so utterly entranced by the supplemental package of a straight-to-video, comic-inspired animated flick. Regardless of your ultimate opinion on the film itself, any serious comic junkie should have this release on their shelf for the special features alone. Filmmakers Commentary -- First up is an informative, neatly organized commentary packed to the brim with engaging speakers like director David Bullock, executive producer Bruce Timm, supervising producer Mike Goguen, voice director Andrea Romano, screenwriter Stand Berkowitz, and DC Comics Senior VP Gregory Noveck. The room never devolves into chaotic, tangential conversation and the track sounds more like a business meeting than a roundtable commentary. Believe me, that's a good thing. The filmmakers cover everything -- the pre-production meetings, the adaptation of the original graphic novel, the casting decisions, the animation process, and the end result. I found the whole thing to be an excellent addition to this release and actually wished the group had more time to speak. Commentary with Darwyn Cooke -- One upping a room full of passionate filmmakers is the well-spoken writer of 'The New Frontier' graphic novel, Darwyn Cooke, who provides a fascinating commentary in which the award winning writer must balance his excitement at the things that made it to the screen with his disappointment at the subplots that had to be cut. It's almost brutal to hear him stifle his sadness at truncated side stories like his John Henry tragedy, but Cooke handles it in stride. He understands the needs and sacrifices required to create an adaptation of a written work. Beyond this initial struggle, Cooke gives a wonderful discussion on his intentions and vision with the graphic novel, the emotional threads he tried to carry through the story, and the characterizations and nods to DC history that he embedded in his work. Best of all, he gets genuinely excited when his ideas are completely realized in final animation on the screen. I can't recommend this excellent track enough. Super Heroes United: The Complete Justice League History (SD, 39 minutes) -- Since I grew up a Marvel Comics kid, I never understood the full breadth of the Justice League mythology. This compelling documentary provides a fine introduction to the characters, their comic appearances, and the differences between their original and modern characterizations. A literal avalanche of comic heavyweights (from DC and Marvel) appear in interviews to discuss the JLA and I found their thoughts incredibly interesting. The filmmakers show up as well, but I itched for the camera to return its focus to the Stan Lees and Joe Kellys of the documentary. Even JLA aficionados will probably learn something they didn't know before. While it will mainly appeal to fanboys and comic geeks, this is an intriguing compendium of DC history. Homage to the New Frontier (SD, 10 minutes) -- While the information in this comparative featurette feels a bit repetitive after listening to the Darwyn Cooke commentary, it's a real treat to see the original comic panels next to the finalized animation. Narrated by Cooke, this mini-doc explores the exorcised subplots of the graphic novel and highlights key similarities and differences in the film. The Legion of Doom: Pathology of the Super Villain (SD, 34 minutes) -- This fun documentary is actually a companion piece to the "Super Heroes United" special. This time, the comic heavyweights look into classic baddies and the events that created their unique psychological dispositions. Like the "Heroes" doc, my favorite parts involved the examination of the parallels between a decade's conflicts and the nature of its comic villains. The creators and writers offer brilliant dissections of the relevance of comics over the years, as well as the manner in which comics became a source of social commentary and satire. Batman Gotham Knight Sneak Peak (SD, 9 minutes) -- Tapping into my love of comics and anime is this wonderful extended trailer that has me chomping at the bit for the straight-to-video release of 'Batman Gotham Knight.' Intercut with interviews from creators, animators, and DC bigwigs, this preview features concept art, finalized animation, and plenty of teasers to make you just as excited as I am about this summer release. Bonus Justice League Episodes (SD, 54 minutes) -- The only shrug-inducing addition to the supplemental package is a collection of three episodes of the "Justice League" cartoon series. Still, while I consider the poorly transferred shorts to be entirely skippable, I'm sure they'll still please DC animation fanatics. Perhaps if they were presented in high definition, the studio would have caught my attention. 'Justice League: The New Frontier' has something for everyone. While the film's story doesn't pack the punch of Darwyn Cooke's original series, it does muster up plenty of thrilling animated action that capture the essence of the characters. Even if you don't entirely enjoy the flick, don't write-off this Blu-ray release just yet. It features a striking video transfer, a bombastic TrueHD audio track, and a wealth of supplements that are worth the cost of admission alone. Despite the fact that I have a few reservations with the film itself, I'm really impressed with the total package. Comic fans should definitely consider picking this one up.